Details are HERE! But I’ll copy paste SOME of the info which we wanna know but click the link for more intimate details. 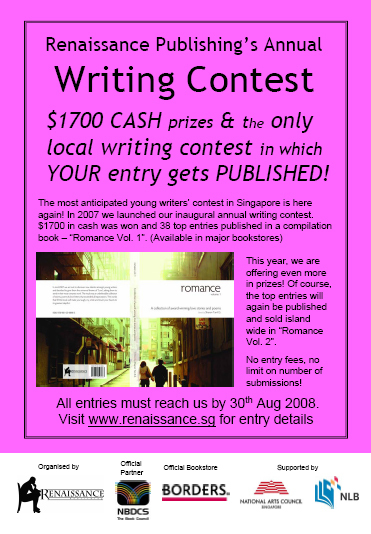 Closing date for receipt of all entries is 12 midnight Singapore time on January 31, 2009. The Short List of 3 entries will be published on the Marshall Cavendish and National Arts Council website on February 14, 2009. The winner will be announced on February 28, 2009. Continue reading Asian Chic Lit Competition!! Posted on January 16, 2009 August 11, 2010 Categories Competitions, The Literary4 Comments on Asian Chic Lit Competition!! Yes, Singapore IS a commonwealth country. Anywho, details are up, look, look! The Competition is an annual scheme to promote new creative writing. £2,000 and there are regional prizes of £500. theme. Entries may be made by both amateur and professional writers. – The deadline for entries is May 11, 2009. For rules of the competition and more details, visit HERE! Posted on January 13, 2009 January 13, 2009 Categories Competitions, The LiteraryLeave a comment on Commonwealth Short Story Competition! I found this in my email one second after posting in my (more insane and personal) blog. I don’t mind people reading that other blog (if you are actually actively searching for who knows what!) but it’s rated MORE insane and with a warning that one shouldn’t ever read it while drinking anything for it might make you laugh insanely or something. Heck, I’m BARELY restraining on this so called “serious” but not really serious blog. YES!!! YESSSSSSS!!! You guys should know where I’ll be today at 6pm in any case. Ps. I guess I should upload my other review on another book I have before this becomes a Meg Cabot fan blog or something. Posted on October 6, 2008 October 6, 2008 Categories Competitions, The LiteraryTags eventsLeave a comment on DOUBLE OMGOMGOMG! Man, is that a long title. Deadline is 24th September, just got the info from my friends who JUST got the info from her school. • Be published in a UNESCO book specifically highlighting the achievements of young communicators to be distributed globally. So if you’ve got any media papers and such according to their themes, check it out! Their website is at http://www.renaissance.sg/ , check it out and enter! Well, as long as you’re under 25. I know I am… I wonder if I should join. Posted on July 9, 2008 Categories CompetitionsLeave a comment on Renaissance Romance Writing Competition!! And a bunch of 48 hour short films. 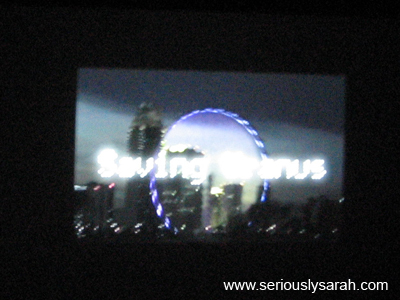 We were at Eng Wah, Suntec to watch our short film and see what did the other teams do. Michael Rogers did a little intro about the whole thing, I can’t remember where Megan Shea was but I think she was somewhere in the front too. ANYWHO! Apparently only two teams (including mine) were the only late ones amongst the whole load of them. So ours was screened the second of the whole lot since they screened the late ones first. 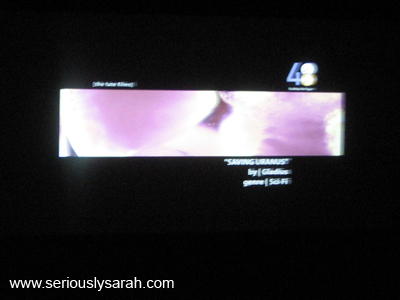 Which is kinda cool since we got to see our intro and all that on the big screen. Blur pics cause it was after all, A DARK CINEMA. In any case, Gladius Studios will upload the video on youtube soon and you guys can watch it. Truly, it was fun to do it. Heh heh. Hopefully there’ll be more short film productions I’ll be involved in, in the future. 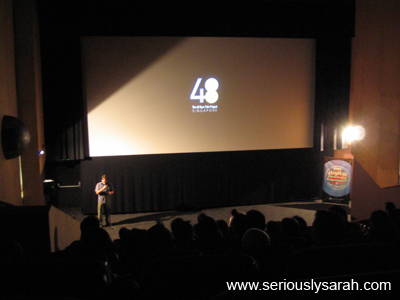 Posted on May 7, 2008 May 7, 2008 Categories CompetitionsTags short filmLeave a comment on 48 Hours screening! 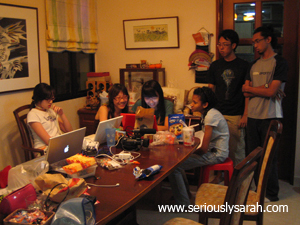 We took part in the 48 Hour Film Project in the Singapore region. We, meaning Gladius Studios. It started at, okay, supposedly 7pm on 25th April, Friday but our official time after waiting for people and stuff is 8.30pm for submission instead. 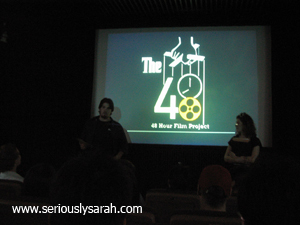 That’s Mike Rogers and Megan Shea of 48 Hour Film Project people thingy briefing us at the Arts House’s screening room. Line: I have always wanted to do that. And for our genre, our team got Sci-Fi. With that, everyone scrambled out of the Arts House once all the teams got their genres and onwards ho! It took like… good grief, at least until 3am or so to get the idea of what we wanted? 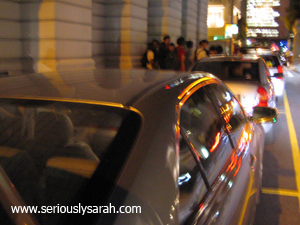 It was the darned ang bao that stalled us somehow. At that time, we got the story set more or less… Technically less but whatever, it got groovy the next day on Saturday. We were doing bits of the script while waiting for the cast to arrive or preparing the area too since we were at an office. And then we were set to go… I totally love the actors and actress since they were SO pro at this. Or maybe it’s the fact that most of us in the crew and cast were media students and knew what to do. But overall, they were fabulous anyway. What I can say however is that I realized that I hate offices in high floors. Okay, actually to be more specific, I hate riding lifts that goes insane on the pressure and speed as you zoom upwards somehow. It made me go gah even until I got back home with Jer (the guys continued shooting at the office and I picked up Jer so we could do the animated scenes at my house before we headed off to headquarters to edit after all that). Last day, Sunday… Spent the whole night/day of Saturday through Sunday to edit and animate. 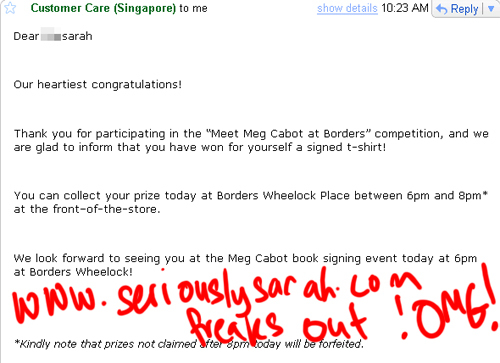 Unfortunately, we aren’t eligible for the judge’s prizes cause we submitted late. We figured we’re rather submit late and let it look good than semi bad and have a probability of ending up late there anyway. We’re still eligible for the audience choice awards though! OH YES, SAVING URANUS IS OUR TITLE!!! Have a preview of some stuff you’ll get to see in the short film. Yay for Jer doing it. 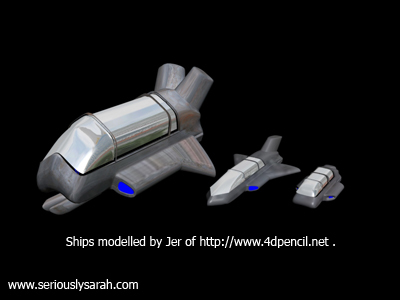 These are technically the three models of ships used in the intro. 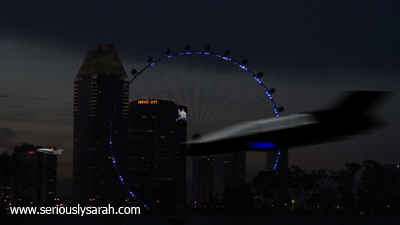 OH GEE, is THAT the Singapore Flyer? COME watch it at Eng Wah Suntec to find out! No, really. It’ll be screened there. And of course, the screencap above isn’t the real thing, it has more effects than those. Will post up more info until then but the screening is on May 6! Tickets info will be known soon. GROOVY JOB YOU GUYS OF GLADIUS STUDIOS! And I have never eaten so much Mcdonalds ever since that weekend.